Charter fishing in Punta Cana is basically undiscovered territory. The waters offer great deep sea fishing for Marlin, Tuna, and Dorado; attracting professionals from all over the world for a big tournament every August. They even hosted ESPN's Billfishing Xtreme tounament last July. 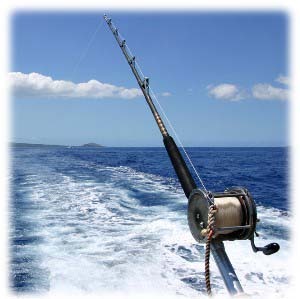 However, there are very few professional crews offering a good service to go charter fishing in Punta Cana. The experience you'll have fishing is all about who you get to take you out; this is one excursion that you're definitely better off setting up before you go! Here is what I've learned about deep sea fishing in the Dominican Republic. I have had every level of trip imaginable while charter fishing in Punta Cana. My experiences range from being on professionally crewed boats where we hooked huge yellow fin, Marlin and dorado to being on a tiny boat manned by yahoos taking us for a ride (literally). Be very careful who you go with, many of the crews in the area are virtually untrained and are only there to take your money. Half-day charters generally go for $600 US and a full-day for $1100 US You can usually get on a shared charter for $90 US per person. Fill out the forms below, make sure to include relevent information (traveling dates, hotel) and any questions you may have. They will get back to you shortly. Good luck!